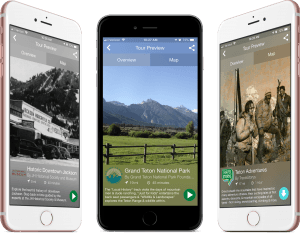 Free Jackson Hole Tours – on Your Smartphone! 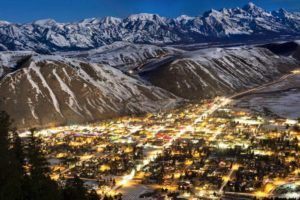 Want to experience the real Jackson Hole?! Toss out your old travel guides and download the free TravelStorys app! It’s easy to use, full of fascinating info, stories and images, and infinitely entertaining. 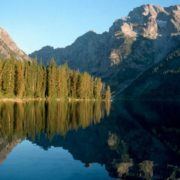 Ten of the app’s 120-plus audio tours are based right here in Jackson Hole. As you walk or drive through the region, the audio triggers automatically, telling you the most interesting stories about your surroundings in real time. How did homesteaders survive Jackson Hole’s harsh climate in the 1800s? Where am I most likely to spot a moose? Who was the “last stagecoach robber” of Yellowstone? What are the dark stripes on some of the Teton mountains? How did the town of Jackson get around the no-alcohol rules during Prohibition? 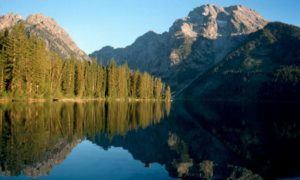 Where are the best places to picnic and hike in Grand Teton National Park? Be sure to download the app and your chosen tours before heading out for the day. 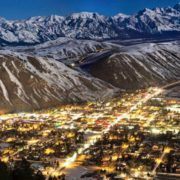 Tour content is accessible even in the most remote parts of Jackson Hole where cell service and Wi-Fi aren’t available, so long as it’s downloaded to your phone ahead of time. You can even “take a tour” from the comfort of your own home! All TravelStorys tours can be accessed both on-site and remotely. And coming this May: Jackson Hole tours translated into Mandarin! https://www.seejh.com/wp-content/uploads/seejh-tan.png 0 0 J Vigorito https://www.seejh.com/wp-content/uploads/seejh-tan.png J Vigorito2019-04-17 19:10:062019-04-17 19:10:06Experience Jackson Hole with Amazing Free Smartphone Tours! Just north of Jenny Lake is Leigh Lake. Less well-known, but just as beautiful and striking. The glacially-formed lake, also with environmentally cool, pristine waters, is two-and-a-half miles wide by nearly three miles long. It sits just southeast of Mt. Moran and where the Leigh and Paintbrush canyons meet. You can get to the lake by way of hiking the easy, flat Leigh Lake Trail. You’ll find the Leigh Lake Ranger Patrol Cabin on the northeast shore. The Cabin is registered on the National Register of Historical Places as of 1990, by the way. To experience the breathtaking mountains and wide fields. To watch elk and moose grazing. To smell the crisp pine-scented air. To swim in clear, cool, pure, glacial lake water. To hear the music of the streams. To taste the freshest produce and the juiciest steaks. To meet some real-life cowboys. To touch those legendary arches at Town Square. To make way for the majestic bison as they regally trod the roads. To dazzle at the sunrises and unwind with the sunsets. To gaze upon the billions of stars that light up our nocturne valley. And it’s okay to say hi to total strangers here. Heck, if you don’t do it, they will. Stop in to our office even, and meet our SeeJH team. The door’s open and the coffee’s not too bad. Yeah. We know you’re coming. That’s why we do what we do here at SeeJH. To pave the way. We know you won’t stop smiling after you leave. We want you smiling before you arrive. You come here for peace. You come for reverie. And you come for fun. See you soon, friend. See you soon. https://www.seejh.com/wp-content/uploads/we-want-you-here.jpg 467 700 J Vigorito https://www.seejh.com/wp-content/uploads/seejh-tan.png J Vigorito2018-03-27 11:59:182018-03-27 11:59:18You want to be here. We want you here.